GP14 Sailing › Forums › Forum › Just thought I would share. This topic contains 3 replies, has 3 voices, and was last updated by Oliver Shaw 6 months, 2 weeks ago. I still need to take care of her paint and most of her bright work, but here she is, Spark with her mast, boom, and standing rigging in place. Tomorrow she will have her running rigging and sails bent on. 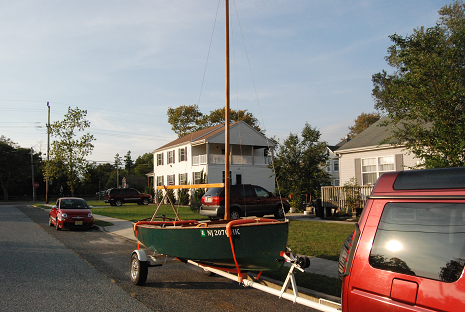 I might make it to the Small Craft Festival in St. Michaels Maryland this week! 5942 will sail again this week.. for the first time since 1981, if I go by the sticker that was affixed to the side of her hull. It has been a long road, I had to rebuild her trailer, strip down and repair her mast and boom, repair her centreboard and rudder, and completely redo her running rigging. I was trying for July, but got held hostage by the welder who was taking his sweet time repairing the trailer. You are correct that allowing the rudder blade to drop to the vertical will reduce the load on the tiller; that is a modification to the original design which was permitted from about the late sixties. What it will not do is to address fundamental imbalance; if you previously needed a particular angle of rudder to keep the boat on course you will still need roughly the same angle, so it will still be slowing you down just as much. The cure for that lies in how you trim the boat, and the rig. A very common mistake made by GP14 sailors, particularly non-racers, is to allow the boat to heel. That will inevitably generate significant weather helm – and the GP14 is not alone in this. This is a characteristic of many dinghies, perhaps most, and also of a great many yachts. As an absolute first priority, make sure that you keep her upright; and if necessary be prepared to spill wind, or to reef, in order to achieve that. Another very common mistake is to sit too far aft in the boat. The bottom edge of the transom should be just kissing the water (which will mean that when sailing two-up the helmsman will need to be up against the thwart when going to windward, and the crew well forward, perhaps moving very slightly aft when off the wind, and well aft only in planing conditions). Both sails should be pulling well, correctly sheeted, and with a good slot between them. Centreboard should be fully down when beating, and less than fully down when off the wind. I myself like to have it about one quarter down when on a dead run or a very broad reach, about half down when on a beam reach, and perhaps three-quarters on a fine reach; but at least one top Gold Fleet sailor at international level has stated his preference for keeping things simple, either fully down or half down, and be content at that. Assuming that you are not reefed, so both sails are used at full size, if you still need detectable rudder angle to keep the boat on course look to adjusting your mast rake. With a modern rig, with flexible spars and modern race sails, the tuning guides will give you a precise starting point for setting the mast rake, and you are unlikely to need anything more than a very slight adjustment. 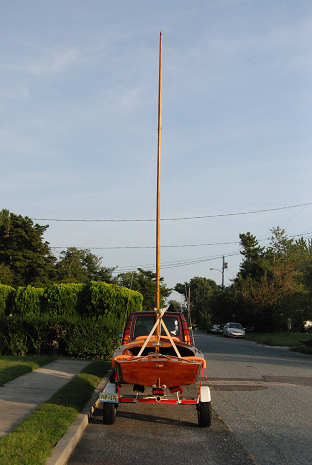 With an older “classic” rig, with stiffer spars, start with the mast upright in the gate, and then adjust shroud length as necessary until you have the helm suitably balanced. Very slight weather helm is ideal; if there is too much, lengthen the shrouds slightly, if there is none (or, worse, if there is lee helm) shorten them. If you reef the sails, ideally reef both of them more or less pro rata. If that is not possible, you may in some circumstances find that this affects helm balance slightly, although the boat is surprisingly tolerant. This reply was modified 6 months, 2 weeks ago by Oliver Shaw.